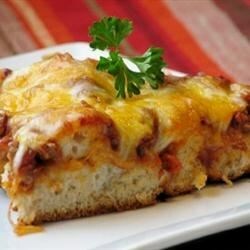 "This is my granddaughter's most requested meal when she comes to visit. It's a meal in itself, but a salad would go nice with it. Have fun experimenting with your favorite pizza toppings." Preheat oven to 400 degrees F (200 degrees C). Grease a 9x13 inch baking dish. Place ground beef in a large, deep skillet. Cook over medium high heat until evenly brown. Stir in pepperoni, and cook until browned. Drain excess fat. Stir in pizza sauce. Remove from heat, and set aside. Cut biscuits into quarters, and place in the bottom of baking dish. Spread meat mixture evenly over the biscuits. Sprinkle top with onion, olives and mushrooms. Bake uncovered in preheated oven for 20 to 25 minutes. Sprinkle top with mozzarella and Cheddar cheese. Bake an additional 5 to 10 minutes, until cheese is melted. Let stand 10 minutes before serving. Loved it! I was out of mozzarella, so I substituted Colby Jack and it was awesome.